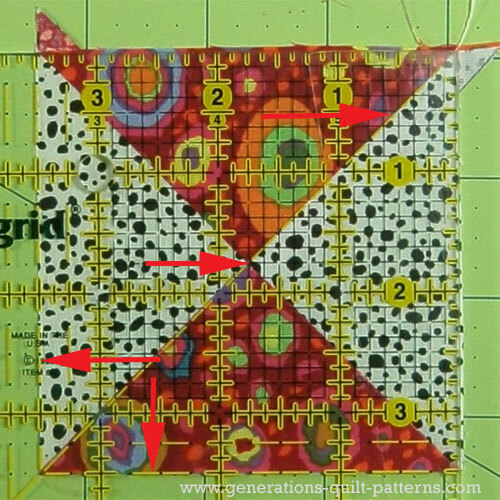 Quarter square triangles are one of the basic building blocks in quilting. And just a smidge more difficult than half square triangles. 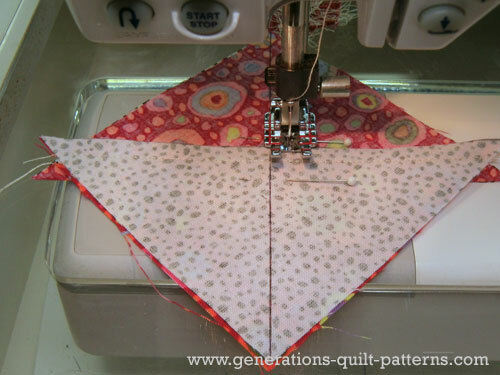 In fact, the first step in this technique is to make a half square triangle. 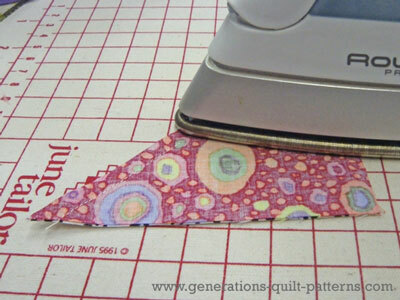 This method is sometimes called the 'sandwich method'; sometimes it's called 'quick piecing'. Either way, it's fast and reliable! ...and add 1-1/4" to it for seam allowances. 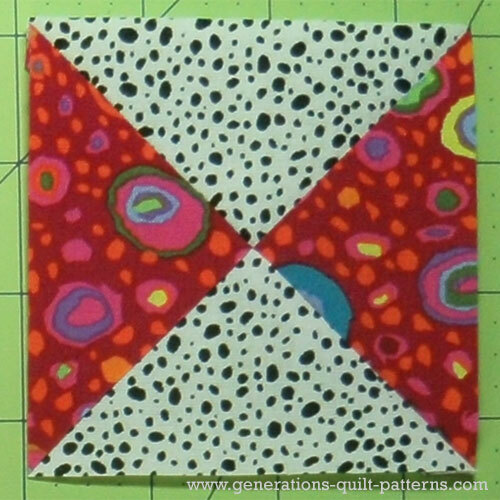 Cut one square this size from two different fabrics. The finished block size plus 1-1/4". For our example, we want to stitch a 3" finished QST unit. 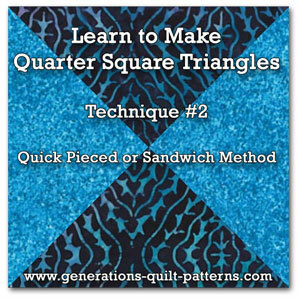 For our first 5 steps, we're making half square triangles just like we did in Half Square Triangles: Technique #1. 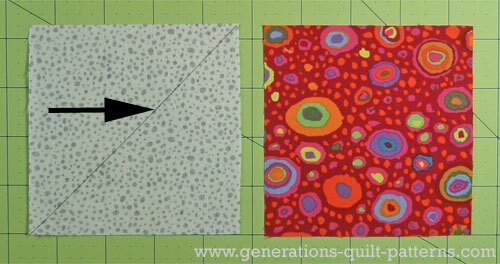 Cut one 4-1/4" square from each of two fabrics. 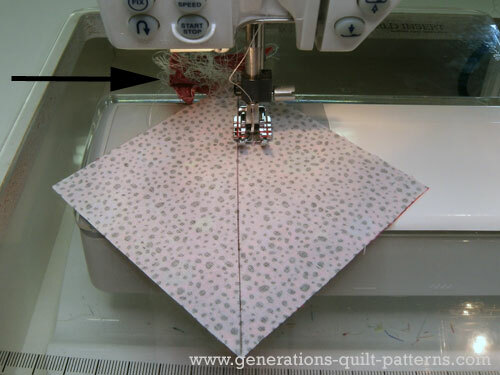 Draw a diagonal line from corner to corner on one of the patches. 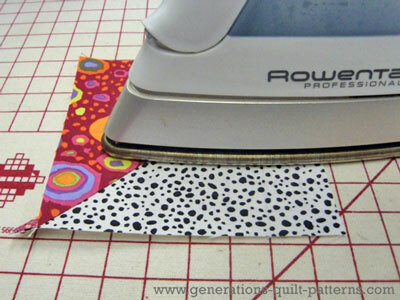 Sew an accurate 1/4" away from the drawn line on both sides. I like to start my stitching on a 'spider' or 'anchor cloth' first. There is less chance of my sewing machine 'eating' the corner of the patch. Cut along the drawn diagonal line. Press the units flat to set the seam. Position the closed patch with the darker fabric on top. Then when you open it to press, you automatically press the seam allowance to the dark side. Press the patch open with the seam allowance towards the darker fabric. At this point, you have created two half square triangles. On the back of one of the units, with a ruler and pencil draw a diagonal line from corner to corner. This line bisects the seam. With RST, alternating dark and light fabrics, align the outside edges of the two units and nest the seam allowances together. If you feel more comfortable, use a pin or two to hold the patches together. Stitch 1/4" away from both sides of the drawn line. The seam allowance on top is pointing towards the needle. There is less chance it will get 'flipped' during sewing. Cut the unit in two on the drawn line. Press again as in Step 5. If you chose the 'Exact Size' from our Cutting Chart, the only thing you'll be trimming here are the dog ears. For this example, I did cut my squares using the 'Exact Size' and you can see that my sewing was a bit off today. The block is a wee bit bigger than it should be. Find the intersection of this number on your square ruler. Trim the excess fabric from two sides. 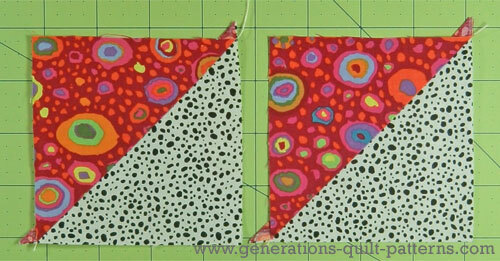 Turn your block to so that the other two edges are in position to be cut. 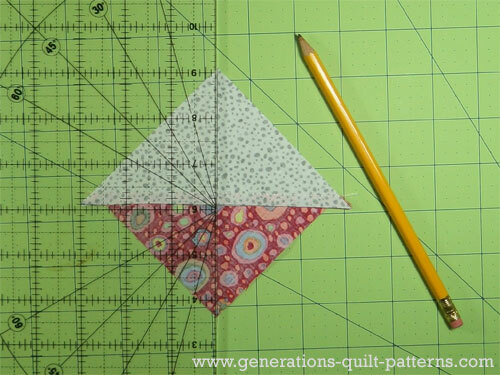 Align the midpoint (1-3/4") on the ruler with the center of the patch. 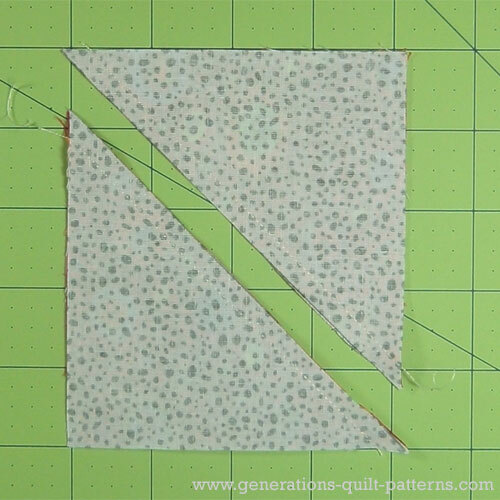 The cut edged should line up with the unfinished block size (3-1/2") markings on your ruler. Trim the final two edges. Your quarter square triangles are finished. 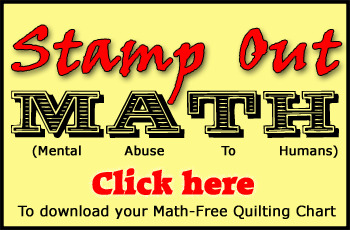 To download and print your 'Quarter Square Triangle Rotary Cutting Chart', just click on the 'Stamp Out Math' logo to the right. Wherever you see this logo on this site there's a new chart to print for your reference notebook.